Before long, essential celebrity publications like People, Us Weekly, and Busy Philipps’s Instagram picked up the story, where it was discovered by readers like me. It’s a wild ride, and I’d love to take you on it. After leaving the restaurant, Deeley spent the next two hours complaining about TOMGEORGE on Twitter. She began by commenting on a screenshot of the restaurant’s Google overview, which included 4.5-star rating she obviously found both inaccurate and troubling. Immediately following that brief and unsatisfying AMA, Deeley quoted a month-old tweet from @FoursquareCityGuide (presumably one she searched for in the heat of the moment) and added, “This place is awful! Avoid at all costs!” She then predicted TOMGEORGE would last no more than three months, and added an emoji of a startled tabby cat to more effectively express her rage. 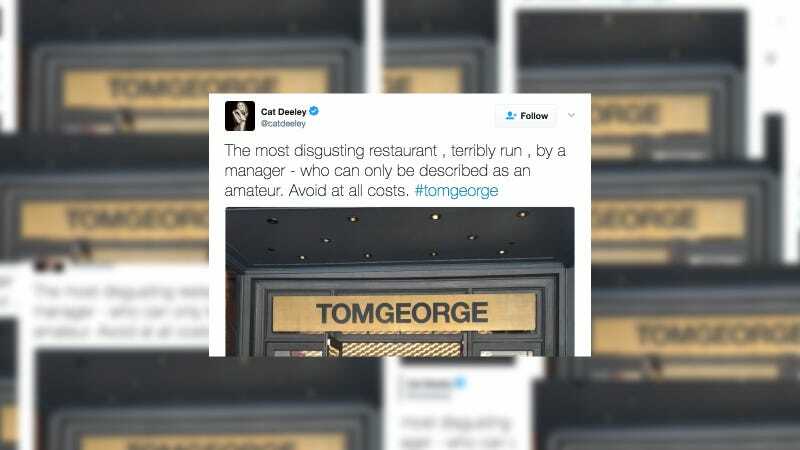 In a stunning turn of events, Joseph Vasko-Bezenek, the server who waited on Deeley during her disastrous experience at TOMGEORGE, found her complaints on Twitter and responded with receipts (yes, literal receipts) that appeared to show that Deeley both received her meal (sans drinks) for free, and refused to tip. Though Vasko-Bezenek’s outed Deeley as an ungrateful patron with no value for the time of others, she refused to apologize for her behavior. She not only retweeted the server’s gentle owning, but verified claims that he treated her with respect and was deserving of a fair tip. The food was terrible and your manager was unhelpful and rude. Respect and love should be shown to all, attention to detail is necessary too! While the amount of comped food shown in the receipt provided by Vasko-Bezenek suggests TOMGEORGE’s food was not, as Deeley alleges, as appetizing as it should have been, her claim that “there was zero service” directly refutes earlier tweets in which she said her server was not at fault. This happened because the story deserved it. This has been a Jezebel explainer.